I have to admit, I’m a HUGE fan of carboside! Not a day goes by that I don’t crave carbs, but due to the very little willpower that I do have, I have to stop myself from the daily occurrence happening! My favorite act of carboside is Spaghetti pomodoro or arrabiata, if I’m looking for that extra kick. Its a great thing to have in the freezer so when you need it you can quickly defrost and have a fresh batch of tomato sauce – so make sure you make a enough to freeze. My sister Emanuelle makes the most incredible tomato sauce and since we live miles apart, me in New York and her in London, I decided to get my hands dirty and make one myself. 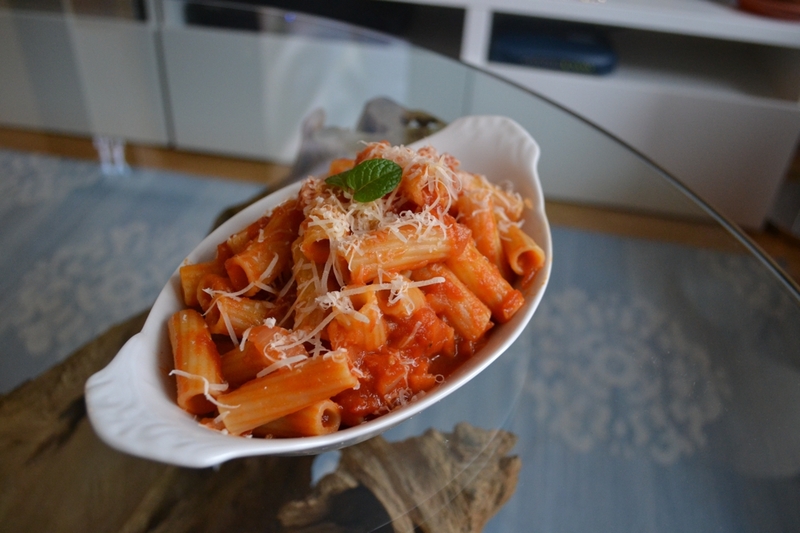 This recipe is for a slow cooked tomato sauce – once I had added all the ingredients to the saucepan I left the mixture to simmer on low for 3 hours, making a delicious, extremely flavorful sauce. Of course it is much easier to make a quick sauce, and there are many great quick sauce recipes but if you do have time to cook it for a while, I promise you, you wont regret it! If you don’t have time you can alway use this recipe and eliminate the last step of slow cooking, once you finish simmering the sauce for 30 minutes initially, it should be extremely tasty too! Reserve the juice from the can of tomatoes, then chop the canned tomatoes. Heat 3 tbsp olive oil in a large pot over a medium-high heat then saute the onion until its golden, about 6-8 minutes and then add in the garlic and saute for 1 minute. Add all the tomatoes, fresh and canned, the reserved juice, sugar and salt and simmer uncovered, stirring occasionally for about 30 minutes until thickened. Add the water, stir and leave covered for 3 hours or as long as you are able to. Add in the basil and then remove from the heat. Looks delicious!!!!! Thanks for sharing. Sounds delicious! Great photos, too.